When everybody started talking about how similar China Glaze Below Deck was to a previous polish of theirs, Channelesque, I looked at the pictures and thought to myself "didn't I just win that polish is a giveaway...?" and sure enough I was right! I of course had to wear it immediately. This is two coats of China Glaze Channelesque, a purple/taupe color with a deliciously smooth creme finish. It applied wonderfully, and needed two coats for full coverage. 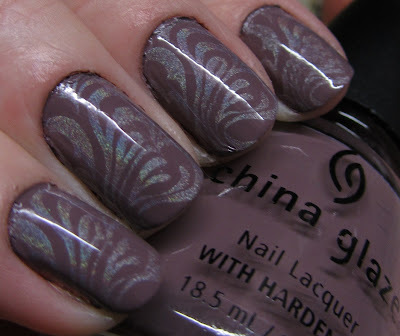 I really love the kind of muted effect of this color, it is really a pretty one! would you say this is a dupe to OPI's You Dont Know Jacques? ?